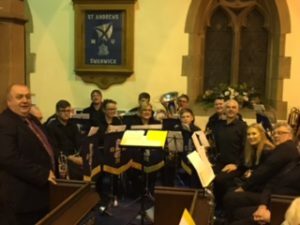 The Concert was enjoyed by a large audience who joined in the singing of some well known carols accompanied by the Shirland Welfare Band who also played a selection of seasonal music under their Musical Director Lyndon Cooper. 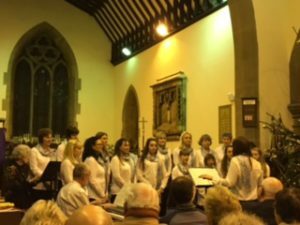 The Alfreton Treble Clef Girls and Ladies Choir under their Choir Director Jacqueline Ayres and Accompanist Andrew Edis sang carols together with other seasonal arrangements. 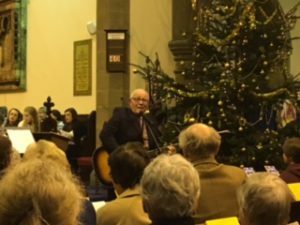 The Guest Soloist Mick Mullarkey entertained the audience with his humorous monologues, singing, playing the guitar and bango. 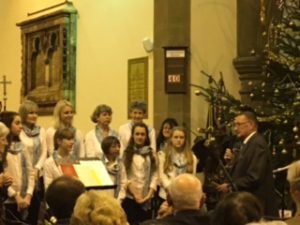 President Roger Stevenson thanked the Band, Choir, Mick Mallarkey for an enjoyable evening, the Mayor of Alfreton and the audience for attending thereby supporting Rotary Charities and wishing all present a Merry Christmas, a Happy New Year and a safe journey home. 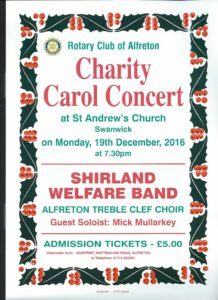 Rotarians, wives, partners and guests will be attending Santos Restaurant at Shirland on Monday the 12th December 2016 at 12.30 for their Christmas lunch. 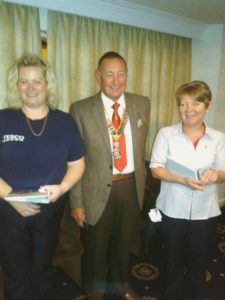 The Rotary Club of Alfreton are delighted to welcome two new Associate Members. 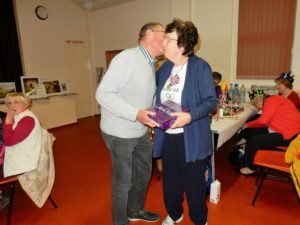 This association is allied to Tesco’s Alfreton store, which is offering assistance with Rotary activities aimed at benefitting the local community. We welcome Joanna Dronfield and Julie Rossington as Rotarians of our club. Induction took place at our regular lunch time meeting at Santo’s, Higham Farm on Monday the 2nd of October. 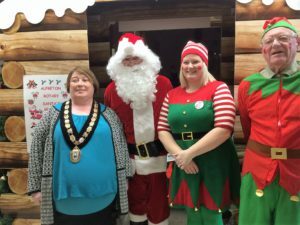 We look forward to working with Joanna and Julie and in particular over the next few weeks when we will be hosting Santa Clause in his Grotto at the Tesco store. 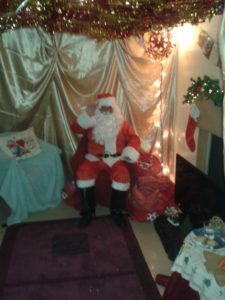 Santa has kindly offered his services, and Joanna and Julie are providing a place for him to meet the children and listen to their wishes for Christmas. If you are interested in joining Joanna and Julie as members of our club, please see our section on ‘Becoming a Rotarian’. A great Quiz night was held at The Community Centre on Mansfield Road Alfreton on Wednesday the 2nd of November 2016. 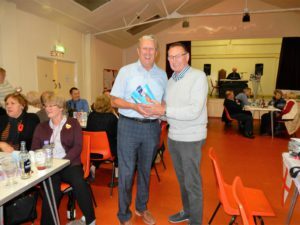 Seventy members and guests took part in a challenge set by the club Secretary John North whose musical questions were as usual played out expertly on his key board. Winner were a team lead by President Roger Stevenson and runners up were a team lead Vice President Dennis Fretwell. The best dressed team on the theme of Olympics was Mandies Marvels from the Inner Wheel Club of Alfreton. During the interval Part a fish and chip supper was provided. 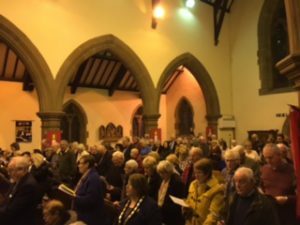 The raffle raised over a three hundred pounds and the funds raised from the event will go to charities supported by the club this year. 7.30 pm Riddings Community Centre, West Street, Riddings. Club members will be present in Alfreton between 1.pm and 3.pm and then from 5.pm to 7.pm when the lights will be switched on. 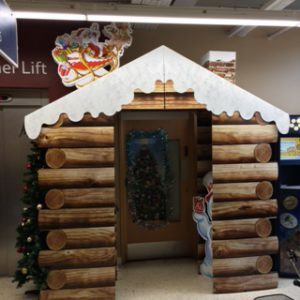 Santa and his Elves will be at Tesco’s Alfreton on the 3rd, 10th, 17th, 18th, 21st, 22nd, and the 23rd of December at the times advertised in the store. Author Dennis FretwellPosted on October 5, 2016 October 7, 2016 Categories UncategorizedLeave a comment on Hello world!